As many of you already know, I am passionate about journaling. I am a regular journal keeper and have been for many years- too many to mention at this point. I love to share my enthusiasm for the Journal Keeping habit with my friends and adhere to the philosophy “One can never have too many books” …blank ones preferably, with lots of room to write thoughts, dreams, and randoms. I have also discovered that many desire to keep a journal but struggle with what to write on a regular basis, beyond the superficial. Here is where the features offered in the Success Choice journals reign victoriously! Whether you are an avid journal keeper or newbie, the Choosing Joy in the Journey Journals can help you go deeper into your journal writing experience. The two journals available are called “Be” and “Power” and each one offers useful prompts that focus on drawing out the quiet, sometimes unheard or overlooked inner voice on a several relevant focused topics. The quality of the paper is excellent and thick enough to not allow for bleed through with most types of pens. The pages are numbered for easy access, reference and indexing as you desire. They are available in a number of formats including spiral-bound, 7 hole punched or un-punched to satisfy the most finicky journal keeper. One aspect creatives will appreciate is the fact the left side of pages are blank and the right are lined. On the bottom part of the lined pages there are short motivational quotes. At the end of each journal there is a Categorized Index to record noteworthy entries or otherwise significant information. The index is further organized into segments which can be designated specifically under the following topics: Plans; Successes; Roadblocks/Challenges; Events; Ideas/Insights/Inspirations; Thanksgivings/Fortunate Incidents. Additionally there is a blank index page. 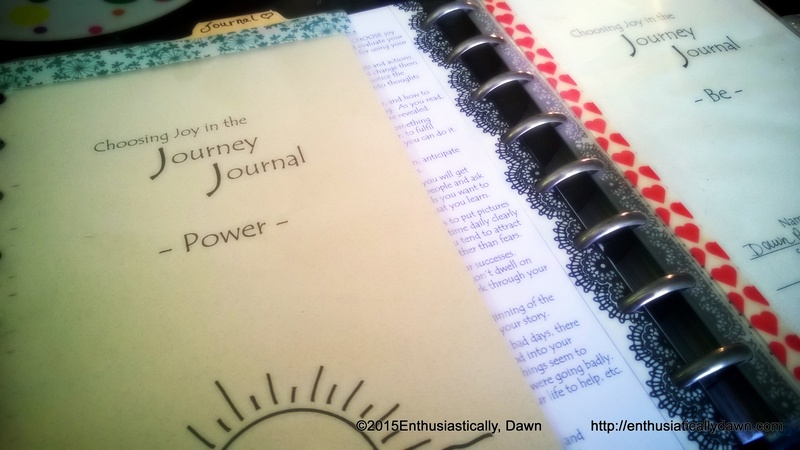 Each journal also begins with 9 Guidelines, to encourage joy in life and journaling, shared by creator Pamela Henrie, who is Owner/Creator of The Woman’s Success Planner & Choosing Joy in the Journey Journals. There are 12 themed topic areas, each having its own series of questions/prompts which coordinate with the Woman’s Success Planner but the journals and planner are not mutually exclusive. Depending on the type of format you prefer, a plethora of beautifully crafted Covers and Binders are available. The themed prompts invite you into character exploring questions and reflections to help reveal and uncover growth opportunities challenging your own preconceived concepts and ideas while stretching your perceptions. The 12 areas of focus are: Be Present, Be Loving, Be Disciplined, Be Goal Oriented, Be Organized, Be Self Reliant, Be Healthy, Be Giving, Be Hardworking, Be Creative, Be Grateful, Be Joyful. Some examples of questions are : ” What do I dwell on that is out of my control?”; “Do I see problems as devastating or temporary?” and “What experiences in my life bring me satisfaction? ” (Be Present) Often, once pondering such open ended questions, one can proceed down any number of avenues at different times and seasons. Theoretically, you could answer the same questions yearly as one’s perception changes over time and journaling can reveal and allow one to record these transforming moments. I find these prompts wonderful to reflect upon and contemplate more deeply over a period of time more than just one session, but the prompts, as are all journal writing endeavors, allow for versatility. To each their own. We all can BE whomever we long to be-if we just allow ourselves the freedom and choice…and ask the right questions. Check out the -Be- Journal. Ultimately there is some crossover but overall I find each one of these journals complement one another and work harmoniously with the planner. I have used both the spiral and un-punched. I have the lovely wool and leather cover which is absolutely gorgeous. It actually is home to my Bible as I tend to over-stuff and the one I have is for the spiral planner or journal. It has 3/4″ Diameter. The Binder for loose-leaf allow for a 2″ ring, which allows a bit more wiggle room. The binders and covers available are absolutely stunning. I am using both the Woman’s Success Planner in conjunction with the Journals this year so I get the best of both worlds. However I strongly advocate using the journals regardless of your planner choice. These pages can be outfitted to travel in your planner of choice well and set you off on your own unique adventures. If you have questions leave a comment below. If you decide to try them, please let me know! I did receive the journals and cover in exchange for a review, but all thoughts and opinions are completely my own. Check out The Success Choice Website and Facebook Page for inspiration and motivation. If you are using The Success Choice Journal or Planner and are interested in a Support Group e-mail me @dawn.paoletta@gmail.com for more information. Love the “Be” journal! Thanks for sharing your review! Stacy , if you do I have a support group on Facebook, for those using the SC journal and/or planner! just let me know when you do so I can add you- it is secret so you won’t find it! Ok. I will do that! Maybe I can swing it out of Friday’s pay…will let you know. Also I did a couple of videos on them and you can see them a bit, if you want me to e-mail them to you I will. Maybe I just will either way. So excited! I just purchased the 7 hole punched “Be” journal! I really love that journal, and know you will as well! Let me know if I can be of support in any way along your journaling journey! Thanks Dawn. I new to journaling.